Brown’s Raid – Fort Ticonderoga, NY – 5th Connecticut Continental Line, Inc.
One of the greatest spectacles of the reenacting calendar! Join Fort Ticonderoga and more than 700 reenactors for an exciting two-day battle re-enactment highlighting the epic 1777 Brown’s Raid! 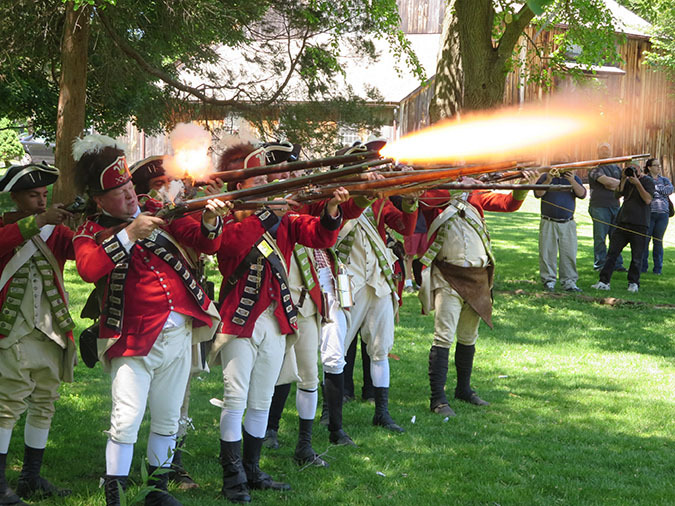 An attack led by patriot Colonel John Brown will take British troops garrisoning Fort Ticonderoga by surprise during the upcoming real-life action adventure at Fort Ticonderoga. Out of the hazy twilight before dawn on September 18th, 1777 rushed Colonel John Brown’s men, catching the British and Brunswick garrison around Fort Ticonderoga completely by surprise. John Brown, no stranger to dangerous missions, helped engineer the first capture of Ticonderoga in 1775. With the stakes all the higher, he would test his luck again. As General Gates prepared to stop the British advance on Albany, he ordered General Lincoln to divide, divert, and harass General Burgoyne’s supply lines back to Canada. Colonel Brown chose his men carefully, allowed first pick of the ragtag patriot force assembled by General Lincoln at Pawlet, Vermont. Massachusetts and Vermont militia men would get their chance to strike a major blow against General Burgoyne’s attack to divide the colonies. Steadying them would be regulars from Colonel Warner’s regiment of Vermonters. Out front, Vermont rangers were to lead the way. Leading the Rangers was, Captain Benjamin Whitcomb, a ranger so skilled in his craft he was a wanted man to the British Army. Rushing down into the LeChute river valley from Lake George landing, Brown’s men captured 330 British prisoners and set 118 American POWs free. Dawn at Fort Ticonderoga would see British Cannons atop Mount Defiance, which forced the American’s to flee that summer, turned on the British garrison itself. British soldiers awoke to the sight of a Brunswick soldier cut in half by a British cannonball fired by Brown’s men from the summit of that hill. Rearmed with captured British weapons, American POWs got a chance to settle their score shoulder to shoulder with Brown’s militia, regulars, and rangers. Destroying supplies, and livestock, capturing boats, guns, and cannons, Colonel John Brown’s raiders disappeared back up Lake George, jumping into the pages of history. For more information, visit Fort Ti’s website at https://www.fortticonderoga.org/events/fort-events/battle-reenactment-brown-s-raid/detail Clothing guidelines and registration details are available at the website. all-day Bethel Parade with Delancey’s Co.
Bethel Parade with Delancey’s Co.
We have been invited to march in Bethel’s parade with Delancey’s Company. Start time and location TBD. Old Newgate Prison. A national historic landmark. Ruins of prison. Abandoned tunnels of old copper mine. Details to come. 5th Connecticut Continental Line, Inc.